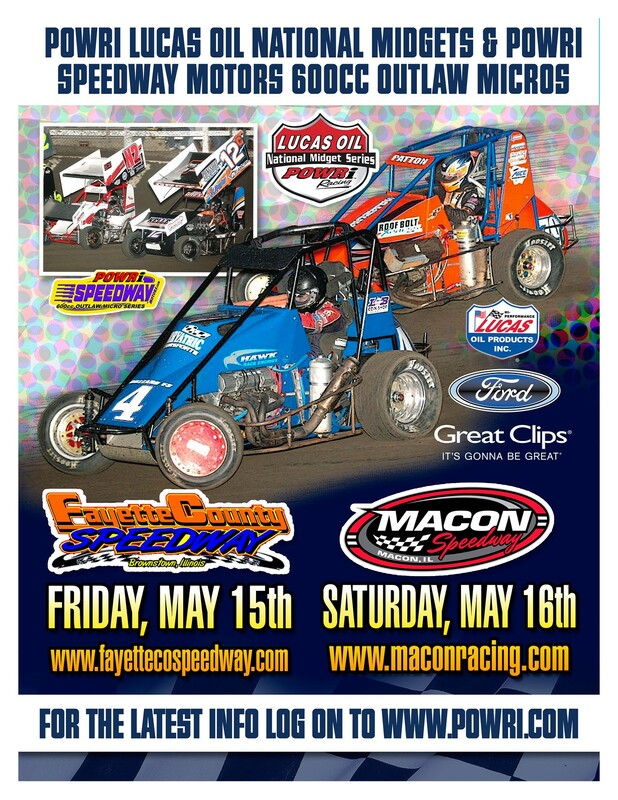 Millstadt, IL – The POWRi Lucas Oil National Midget Series and POWRi Speedway Motors 600cc Outlaw Micro Series will head to Fayette County Speedway in Brownstown, Illinois on Friday, May 15th and Macon Speedway on Saturday, May 16th for a big doubleheader weekend. On Saturday, teams will invade Macon Speedway in Macon, Illinois as the POWRi Lucas Oil National Midget Series and POWRi Speedway Motors 600cc Outlaw Motor Series are set to take the stage. With the weather already claiming the first of six Macon Speedway events for POWRi, fans are anxious to see open wheel racing at its finest at the 1/5th mile high-banked oval. In midget competition, Zach Daum and Bryan Clauson each came out on top in 2014. In the micros, Devin Feger and Nathan Benson claimed feature wins at the track in 2014. Fans can expect to see plenty of rim-riding and slide-jobs galore as both tracks can be described as hammer down and action packed. In addition to the open wheel classes, Macon’s Saturday night card will be filled up with the Billingsley Towing UMP Modifieds, UMP Street Stocks, and UMP Hornets. Pit gates will open at 3:00, grandstands at 4:00, hotlaps at 6:00, and racing at 7:00. Grandstand admission is $15 for adults, while children 11 and under are free. For further information on the midgets and micros, go to www.POWRi.com. For more track information, follow Macon Speedway online at www.maconracing.com, on Facebook (www.facebook.com/maconracing) and Twitter (@maconspeedway). It’s easy to join the Macon Speedway text service. Fans can text MSFANS to 74574 to receive fan information. Drivers text MSDRIVERS to 74574 to receive driver information. Message and date rates apply. Updates are also available by calling Macon Speedway at 217-764-3000.